Touch somebody and say ‘I’m still on fire. I’m under attack, but I’m still on fire. I’ve got some chatter, but I’m still on fire. I’ve got some threats, but I’m still on fire. I’ve got some liabilities, but I’m still on fire. It’s not amazing that I’m on fire. SPECIAL NOTICE: The ‘Holy Ghost’ remix by Jeezy featuring Kendrick Lamar was produced without the knowledge or consent of T.D. Jakes, TDJ Enterprises, Dexterity Music or its associated companies. We are taking the necessary legal actions to stop the unauthorized use of T.D. Jakes’ intellectual property. The song was originally featured on Jeezy’s album, “Seen it All,” and was released as a free download. 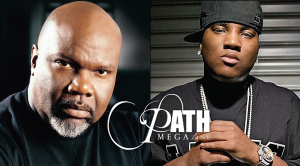 This entry was posted in Gospel Rap, World News and tagged court, Jeezy, legal action, sues, TD Jakes by Kris Patrick. Bookmark the permalink.